Rev. John J. Monahan, CSV, died on Sunday, October 6, 1996 after he was struck and killed by a car while riding his bicycle in St. Anne, Illinois. John was pronounced dead at the scene of the accident; he was 70 years old. Born in Chicago on March 2, 1926, John Monahan graduated from Quigley Seminary in Chicago and joined the Viatorians in 1944. 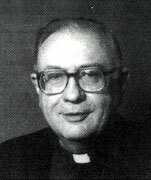 He pronounced his first vows on August 16, 1945 and subsequently earned his B.A. in Social Science from St. Ambrose College. After completing theological studies at St. Thomas Seminary in Denver, he was ordained to the priesthood by Chicago Auxiliary Bishop Bernard Sheil on May 18, 1952. 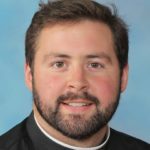 Father Monahan’s early years of ministry found him teaching at Spalding Institute, St. Philip High School, St. Gregory High School and finally, at St. Viator High School from 1965 to 1966. In 1966 he was appointed Associate Pastor at St. Viator Parish in Chicago where he served until being named Pastor of St. Martin Church in Martinton, Illinois in 1975; he served in that capacity until 1983 when he took a sabbatical year of study. From 1984 to 1990 he served as Pastor of St. Jude Parish in Rochester and was appointed Pastor of St. Anne Parish in 1990 where he served until the time of his death. Visitation was held on Wednesday, October 9, 1996, from 4:00 to 8:00 p.m. at St. Anne Church in St. Anne, Illinois; an evening prayer service was held at 8:00 p.m. The Funeral Mass was celebrated on Thursday, October 10, 1996 at St. Anne Church in St. Anne. The Funeral Mass was held at 11:00 a.m., followed by the internment service at 3:00 p.m. at Queen of Heaven Cemetery. In addition to his Viatorian brothers, John is survived by a cousin, Rev. Francis Maher, Wilmington, Illinois. Father Monahan is also survived by several other cousins in the Chicago Metropolitan area. Remember Father Monahan in your prayers and gather together in local communities to remember him in Eucharist.